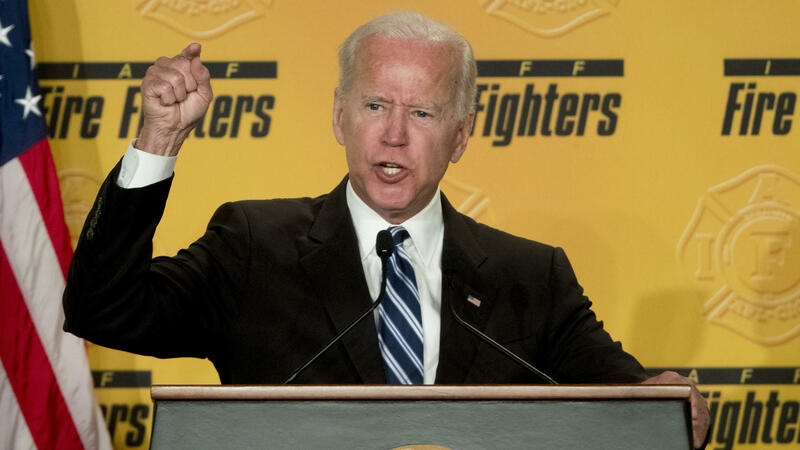 Former Vice President Joe Biden speaks to the International Association of Fire Fighters in Washington on Tuesday, amid growing expectations he'll soon announce he's running for president in 2020. While Biden spent most of his speech talking to the firefighters about core union issues such as the importance of collective bargaining and the funding of health care and pensions, the former vice president did sprinkle his speech with several messages that could serve as the core of a presidential stump speech. "Today we seem to be at each other's throats. Extremism is on the rise in this country," Biden said. "Mean pettiness has overtaken our politics." The globe-trotting politician — who held a post on the Senate Foreign Relations Committee for years before heading to the White House — spoke about the importance of America's role as a world leader, warning that other countries would fill that role instead if the country continues to shrink away from global alliances. Biden also blasted the Trump administration's recent budget proposal. "It cuts $845 billion — almost a trillion-dollar cut in Medicare," Biden said. "Why? Because of a tax cut for the super wealthy ... and now they've got to go make somebody pay for it." "They gave millionaires and billionaires excessive tax breaks. And who are they asking to pay for it? Middle-class families like you." In a clear contrast to President Trump's divisive approach to politics, Biden framed his argument as one meant to reach out to every American. "We can't be defined — we're not able to be defined — by race, by religion, by tribe. We're defined by those enduring principles that are in the Constitution," Biden said. "That in America, everybody gets a shot. That's what the next president of the United States needs to understand, and that's what I don't think this current president understands at all." But as Biden workshops a message of inclusivity, the fact remains that if he enters the race, the former vice president will be a 76-year-old white man running in the most diverse field of candidates in presidential history. Democratic hopefuls such as California Sen. Kamala Harris, Massachusetts Sen. Elizabeth Warren, New Jersey Sen. Cory Booker and others have made a point to highlight racial injustices in policing and economic policies, and have made sure they regularly speak to and about minority communities. Vermont Sen. Bernie Sanders veered from his usual stump speech during his first wave of campaign rallies, in order to speak about racism and the civil rights protests he attended in the 1960s. Biden's speech on Tuesday was delivered to an overwhelmingly male and white audience, and he did not specifically address racial inequality. If he does run, Biden will need to navigate the Democratic Party's increased emphasis on identity politics, as well as the politics of an increasingly energized progressive base that isn't particularly interested in the kinds of bipartisan legislative compromises he spent his career crafting. Biden briefly took on his party's leftward drift Tuesday, bemoaning the fact that "if you've noticed, I get criticized for saying anything nice about a Republican. Folks, that's not who we are." At the moment, Biden remains on top of early Democratic polls. The key question: whether Biden's showing in these early polls is a sign of strength, or just the byproduct of name recognition. Jumping into the presidential campaign is the only way for Biden to answer that question.